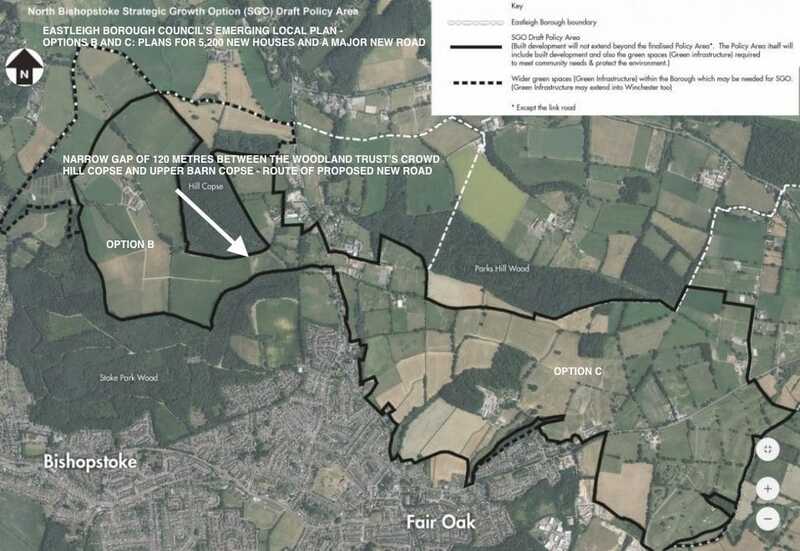 ADD UPDATE, 19 September 2017: The Woodland Trust has rubbished a claim by Keith House, leader of Eastleigh Borough Council (EBC), that latest plans for 5,200 houses and a major new road north of Bishopstoke and Fair Oak, options B and C of Eastleigh’s emerging Local Plan, include sufficient measures to protect ancient woodland. House made the claim in this interview with BBC Radio Solent on 21 July, the morning after EBC voted to continue to pursue options B and C as its preferred ‘strategic growth option’ for the borough. Speaking about ancient woodland in the area (minutes 4.38 – 5.24), House said he believed that the Woodland Trust “haven’t actually looked at the most recent proposals because we have now got massive buffers between development and the [Woodland Trust’s ancient] woods”, implying that, if they had, they would be content. Given ADD’s aim for transparency in Eastleigh’s Local Plan process, we questioned this (and other assertions made by House in the BBC interview) in an article on 27 July, saying: “The fact is that the narrow gap between Upper Barn Copse and Crowdhill Copse [ancient woods owned by the Woodland Trust], through which the proposed new road would travel, is approximately 175 metres and the Woodland Trust says that 100-200 metres is necessary as a buffer ‘to protect plant species from the effects of vehicle emissions from roads’ (click here for more detail).” That said, we noted we would ask the Woodland Trust to confirm it has indeed looked at the most recent proposals and to give its opinion on them. “We have seen the most recent proposals Keith House alluded to. While we welcome the road being moved away from being hard up against our Upper Barn Copse site, it is still clearly inappropriate. The Woodland Trust’s reply speaks for itself: it has seen the latest proposals and firmly rejects them. As we have requested before, Keith House and his council should stop playing games and make decisions on its emerging Local Plan based on the evidence, and the evidence alone. We shall continue this fight until it is won.